Michael Leibowtiz and Christian Lohmaier have finished the bug fixing with the sending of buildbot slave results from the build master to the tinderbox. This now means that EIS has up to date buildbot results too (except from the bots attached to the old build master). This now means that the Mac OS X Intel platform is now in EIS. This entry was posted in buildbot, OpenOffice on May 29, 2007 by smsm1986. At today’s Mac Port meeting, Eric Bachard created a new meta user, macport, on the OpenOffice.org web site. This meta user is to be used for all unassigned issues relating to the Mac Port of OpenOffice.org. It is now the default owner of Mac Port issues. This means that the default owner for issues is no longer ericb, the project lead. See all the open issues assigned to the user macport. If there is anyone doing QA or issue triage, and you come across a Mac OS X specific issue, please assign it to the new user macport. Once a developer has started working on the issue, they should re-assign the issue to themselves. If you would like to keep track of all issues by this meta user, please edit your OpenOffice.org Issue Tracker preferences. 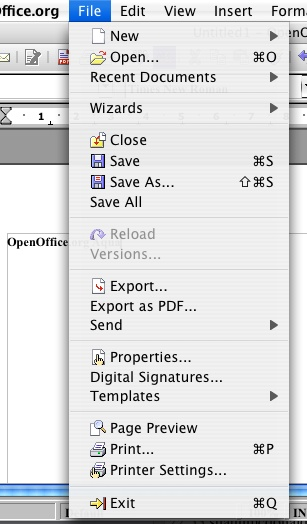 Log in to the OpenOffice.org web site, then head to the Edit prefs -> Email settings page. On this page you can set the “Users to watch” to include macport in the comma separated list. If you do this, you will now get an email as per your email preferences whenever an issue assigned to macport is created or changed. This is another piece of evidence that the Mac Port is active and moving faster than before. This entry was posted in Mac Port, OpenOffice on May 18, 2007 by smsm1986. This morning I woke up to some great news. Sun now have 2 full time employees with many years of experience in programming StarOffice and OpenOffice.org. This entry was posted in Mac Port, OpenOffice on May 3, 2007 by smsm1986. At the moment there are a number of issues with the current language packs for OpenOffice.org. Some platforms such as Mac OS X don’t have language packs, instead they only have full installsets. The language packs currently have to be built on each platform individually. This means extra compilation time and extra storage on the mirror network since essentially the same localisation data is packaged into a different package for every platform. I have a proposal for dramatically improving the current situation. Let’s have cross-platform language packs. This will mean that the language packs will be built once, and can then be used on ANY platform. This will save build time, especially when a builder can just use their fastest machine, instead of having to do it once per platform. This will free up developer and builder time, as well as space on the mirror network. With this change I’m looking at implementing a simple user installation of language packs, similar to what has just been added to OpenOffice.org 2.2 for extensions. This would enable platform integration for the language pack installation. We could possibly go as far as Firefox and deploy language packs in a very similar way to extensions. We could even have the option to install language packs just for one user or for all users of the installation. If the platform supports it, a server deployed location for the language packs should be possible. This is just an idea, it needs more development before implementation. No implementation testing has been done yet. An initial idea check for daftness has been completed, which is why this mail is going out. I’m looking to see if there are any foreseeable problems with this proposal, and whether there is backing from the whole OpenOffice.org community. This entry was posted in Mac Port, Open Source, OpenOffice on March 31, 2007 by smsm1986. Further to Eric Bachard’s mention on his blog. I have now updated the time line for the Mac Port of OpenOffice.org and added a new news item for it. 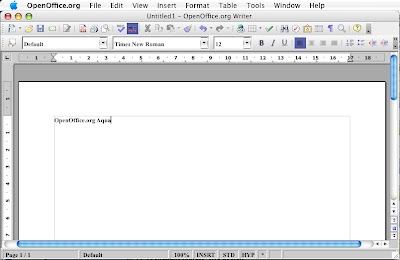 We are currently looking at a May 2007 release for the Alpha of OpenOffice.org Aqua. Around the end of the year we hope to have a beta release of OpenOffice.org Aqua available. This entry was posted in Aqua, Mac Port, OpenOffice on March 24, 2007 by smsm1986. It seems that some people, including young IT professionals, who have not yet heard of OpenOffice.org are amazed at the project. This entry was posted in OpenOffice on March 11, 2007 by smsm1986.